The problem facing every author tackling James Bond is they will always be compared to creator Ian Fleming’s version. The other issue for them will be the public’s own expectations and understanding of the character. Everyone has their own interpretation and with millions having read the books and an estimated one fifth of the world’s population having seen at least one of the films then best-selling crime author Jeffery Deaver had a thankless task on his hands. In a bold move Deaver has opted to transport the quintessentially iconic Cold War character into the Twenty First Century. This Bond is a child of the 1980s, a non-smoker and a veteran of Afghanistan. 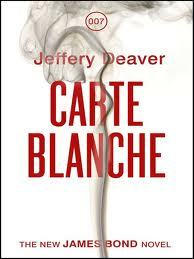 This is at odds with Fleming’s ‘blunt instrument’ and anti-hero, but no doubt aware that modern audiences would not buy into a chain-smoking, heavy drinking intelligence officer Deaver has quite rightly updated the character. Deaver has clearly done his research on the various international intelligence and law enforcement agencies; one of the books strengths is its portrayal of meddling self-interested bureaucrats. The IQ phone (geddit? ), the Oakley’s, the Rolex and the unashamed product placement does grate at times. I know Fleming liked his gadgets and accessories but this is unnecessary and wearing here. The creation of Sanu Hirani as Head of Q Branch is a masterstroke replacing the avuncular Major Boothroyd with a young cricket obsessed family man, which rings truer in this modern age. Bond’s housekeeper May, M, Monneypenny, Mary Goodnight and Bill Tanner are all present and correct and well written. Deaver has effectively captured their personalities and their relationships and interaction with Bond manage to convince. I also liked the fact that Deaver writes extensively about Bond’s often overlooked Chelsea flat, his love of cars and his family background, this all serves to make him more flesh and blood. Setting the early action in London and the Fenlands is good as all too often the emphasis is placed on quickly whisking him away to an exotic location. Not since Fleming’s underrated ‘Moonraker’ has Bond spent as much time in his own country in an adventure. We thus see him at work; learn about his haunts and habits and come away feeling that we know him much better. The women in the novel are interesting: Ophelia ‘Philly’ Maidenstone is a work colleague in London and is every much of a petrolhead as Bond, a true modern woman. Bheka Jordaan is a tough no-nonsense and professional character and Felicity Willing is independent and passionate about her cause. The only annoying thing is that Deaver has continued the tradition of ridiculous sounding names for leading female characters in the series; I wish they would dispense with this! Severan Hydt is a particularly repellent villain who made my flesh crawl. Hydt is the CEO of Green Way International plc which deals with refuse disposal and recycling. His creation makes a refreshing change, as he is believable rather than a cartoon caricature that fans of the series have been subjected to over the years. At long last there are no grotesque disfigurements, scars, eye-patches, missing limbs or hooks. Instead he has long yellowing fingernails and a dark obsession. Hydt is not a political terrorist but has his own twisted pleasure and gratification to satiate. The plot’s focus is mainly a formulaic race against time with Bond attempting to uncover what Hydt is planning and to ultimately thwart his plans. Niall Dunne is Hydt’s number two and is also a decent creation, he is a tough professional who intimidates even his own employer such is his coldness and love of machinery rather than humanity. So kudos to Deaver for providing Bond with two plausible and unsettling villains to tackle. I also enjoyed following the action to new locations such as Serbia, Dubai (UAE) and Cape Town, South Africa (apart from a brief appearance on the African continent in Fleming’s novel ‘Diamonds Are Forever’ this is his first mission extensively taking place there). It makes things more interesting and engaging. I thoroughly enjoyed reading as Bond’s investigation took him to the townships as well as the city and Hydt’s centre of operations. My only criticisms of the story is a description of Dunne standing ‘still as a Japanese fighting fish.’ Pardon? I doubt very much that a British agent would exclaim ‘goddamn it!’ as much as Deaver’s Bond does (maybe Jack Bauer would but not James Bond). Appearances by Rene Mathis and Felix Leiter also seem crowbarred in and after a promising start the pace slows considerably, before picking up at breakneck speed for the finale. The twists are good even if the reader can see some of them coming. Ultimately this is a brave, satisfactory effort that manages to take a popular character into new territory with mixed results.